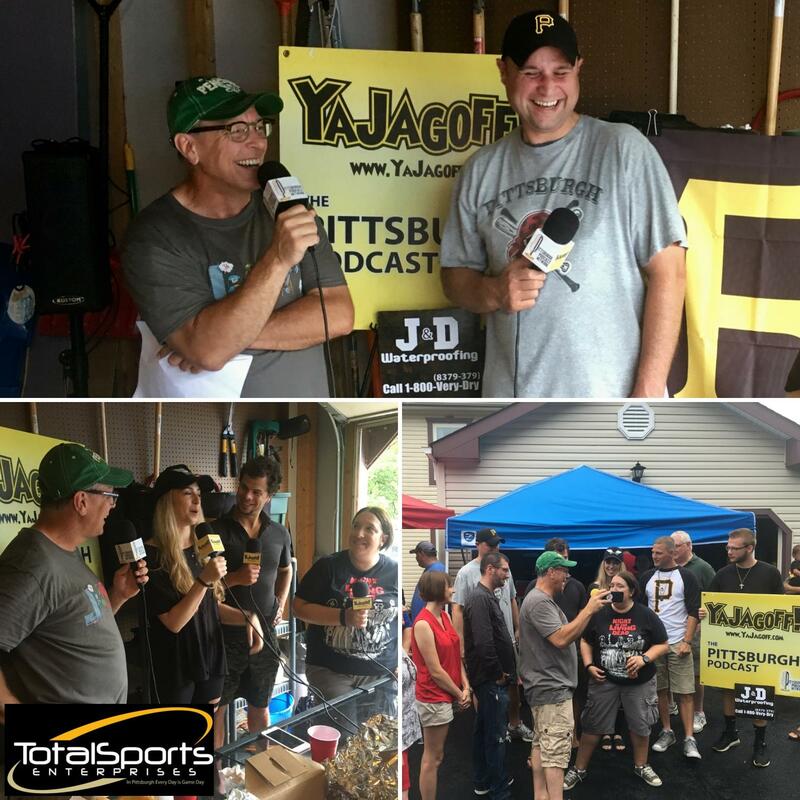 The 2017 Summer Porch Tour presented by J&D Waterproofing stops in Rural Ridge! Because of the rain, we hung out in Amy’s garage where, once again, we had tons of food made by her and the neighbors to go with the Ricci’s Sausage that we brought. WTAE-TV meteorologist Ray Petelin came with us and so did Brandi and Tyler Kennedy. So it rained a bit but, our buds from Everyone Loves Fun Entertainment STILL had something to entertain everyone! Mimosas from The Foundry Table & Tap were flowing early again. If you don’t see the player bar above, CLICK HERE to listen to the podcast. YaJagoff! Podcast – Show Notes: Episode Music: Justin Wade and Bobby of the Justin Wade Band hung out playing original and cover tunes. SPONSOR: Total Sports Enterprises has mini helmets, pictures, clothing and more in black and gold and beyond with athlete signings in Virginia, Chicago, as well as Pittsburgh. Visit tseshop.com to see where TSE will be this summer like the Pirates fan fave Adam Frazier who will be signing at the Mall at Robinson on August 5. Total Sports Enterprises has all of your sports needs since every day is game day at TSE. Erin from Everyone Loves Fun Entertainment brought a popcorn machine and all kinds of games to keep everyone entertained. Total Sports Enterprises gave Amy an official Pirates banner. 09:23 Ray Petelin is no stranger to the podcast. And, no stranger to being called on the carpet for bad weather. But wait… did he say he was a DJ rapper and, what is the secret phrase, that must be repeated 3 times, to stop the rain??? Brandi has started a new on-line clothing store based upon her taste for monochrome styles. It’s named for her daughter, Cookie Couture Clothing. 34:19 Justin Wade and Bobby, who have been entertaining everyone from the corner of the garage talk about the band, their newly release single, Four Wheels, and their upcoming single, Your Name. See them play live at these dates/locations.